A team of six Arrowhead participants from ResEQ (Liang Chang and Tyler Wirontono), DIC (James Saldana, Walter Salas, Michael Grunwald), and Marketing Solutions (Steve Goebel) visited UC San Diego’s Englekirk Structural Engineering Center and attended a full-scale wooden structure shake table test on July 13. The test is a part of the Natural Hazards Engineering Research Infrastructure (NHERI) TallWood Project (yes, that’s a mouthful), funded by National Science Foundation (NSF) to study the resilience of tall wood building design and construction in regions of high seismicity. Six U.S. universities spearheaded the project, including UC San Diego, with broad industry collaboration. The test is a part of the Natural Hazards Engineering Research Infrastructure (NHERI) TallWood Project (yes, that’s a mouthful), funded by National Science Foundation (NSF) to study the resilience of tall wood building design and construction in regions of high seismicity. Six US universities spearheaded the project, including UC San Diego, with broad industry collaboration. 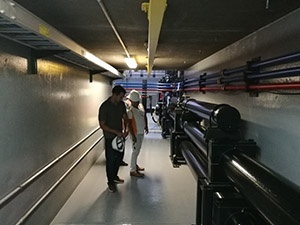 In the test our Arrowhead team observed, the two-story building was shaken by a temblor with a magnitude of 6.7 – the same power of the 1994 Northridge quake – but the test ran twice as long. 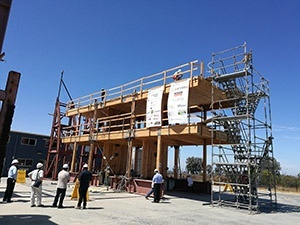 The project was specifically testing the use of specially laminated lumber as framing material, and would it withstand a major quake better than current building materials. “The exact movement of the Northridge EQ from 1994 was programmed into the computer model, so when they basically clicked ‘play,’ the whole shake table commenced a sequence of shaking to mimic Northridge,” explained Steve Goebel, business development manager for Marketing Solutions. 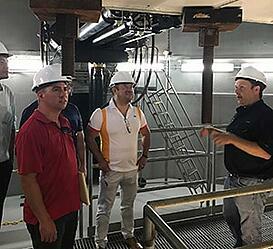 At left: The team tours the “underbelly” of the earthquake simulator. View the test video here. Why is this so important? “They’re achieving more resilient building performance in large earthquakes, namely that tall wood buildings designed using this methodology will be safe and have significantly shorter repair/recovery time after major earthquakes,” explained Dr. Chang. 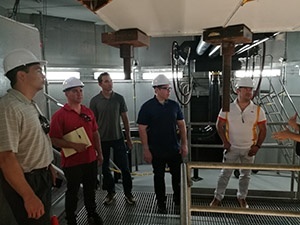 Afterwards, the Arrowhead team, accompanied by Prof. Andre Barbosa, toured the shake table experimental facility at UC San Diego, the largest outdoor earthquake shake table in the world. EQ test “shake table” “I sure hope this frame holds up down here,” thinks Goebel. “It was great to hear how new construction is not only working to improve building codes for safety and life preservation, but also building a structure that can be more easily and more cost effectively repaired after an EQ event,” said Goebel.